It seems as though it is a topic that finds itself constantly in the press. We continuously see its effects in both the decreasing levels of San Diego’s once teeming reservoirs, as well as in the increasing presence of wild fires around the county. The current drought situation in the state of California, more-so in the desert landscape of San Diego, is a problem that affects all California residents. With California facing one of the most severe droughts in history, a State of Emergency has been declared by the Governor. State officials, as well as the residents of California, are being called upon to take any and all necessary steps to conserve one of our state’s most precious resources. One of the most noticeable results of California’s water shortage is evident in the water bills of its residents. Due to the shortage, the price of water service has increased dramatically in recent years. This is a price we pay for living in the desert landscape. Of course, this also means that the idea of water conservation equates directly with a lower water bill. The trick is figuring the best place to cut out water use. It has been estimated that nearly 60% of a person’s household water footprint can be attributed to lawn and garden maintenance. Residents care about the aesthetic of their homes so much, that they spend more than half of their water in an effort to keep their yards looking nice. Cutting this watering out can have a dramatic effect on reducing a household’s water bill, but it will also leave your lawn and plants withering in the soaring temperatures of summer. Finding a balance between water conservation and making sure the aesthetic of your outdoor area does not succumb to the heat is a battle faced by many homeowners around the county. Many residents have found their answer through an assortment of products available at RCP Block & Brick. A popular option chosen by many homeowners has been to either completely replace or limit unused lawn areas with natural rock and stone. Incorporating this type of product into the landscape design of your yard can completely eliminate the need for watering while still leaving an aesthetically pleasing yard. 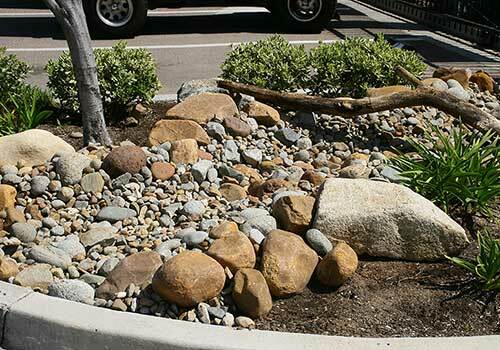 Although some residents find it easiest to simply cover the area with one of our available decorative rock ground-covers, other have planned out beautiful rock landscapes (such as dry stream beds), that incorporate a mixture of decomposed granite, decorative rock ground cover, medium sized cobble stone, and larger landscape boulders. It is amazing what you can create with a little bit of imagination and the available products at RCP Block & Brick. 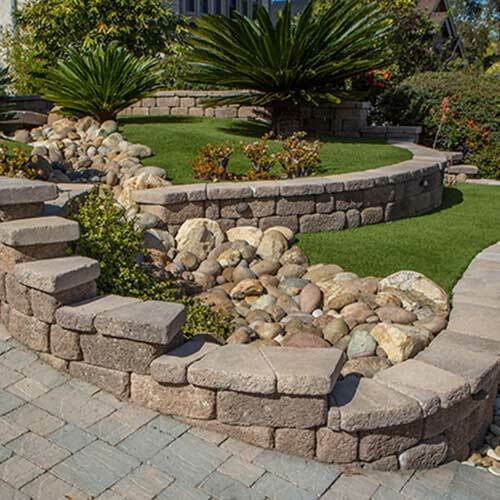 For every bit of natural rock and stone that you use in your landscape design is that much less water you need to keep your yard looking great. Some residents have completely eliminated the need for water while still having an aesthetically pleasing landscape design. Although absolutely gorgeous landscapes can be created from rock and stone alone, plants add an organic, natural element to all landscapes that just cannot be duplicated. Expanding on the above idea of adding rock and stone in your landscape design, consider adding native or drought tolerant plants to the design. These plants will thrive in their natural outdoor environment while requiring only the most minimal watering. They will also add that finishing touch the design as a whole. For those who simply do not want to give up the look of their lush, green lawn but are being hit hard by the high water bills, there is still hope. RCP Block & Brick carries an expansive line of the highest quality, most realistic artificial turf available. If you haven’t seen it, come check it out. Our artificial turf is not your standard “Astro-turf” or fake looking grass. Through years of development and testing, our turf providers have come up with a line of highly realistic fake grass. Using a variety of blade lengths, colors, and textures, they have come up with a line of artificial turf that closely matches the beauty of real grass. 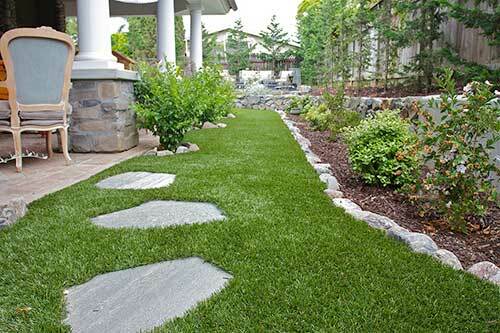 RCP Block & Brick has all the turf supplies needed to installing artificial turf in your yard. Save water with a single brick. It sounds like a joke, but has actually been standard practice for years with older, non-water conservation toilets. 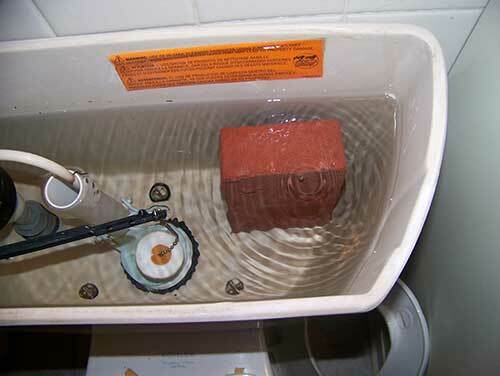 By placing a fired clay brick in the reservoir of your toilet, you can displace the amount of water that is used every time the toilet is flushed. So for every flush, you are using a brick amount less in volume of water. Over the course of time, you can save hundreds of gallons! RCP Block & Brick has a variety of brick sizes in assorted colors and styles. Not that the color and style matter, but we have them for those customers that want to have a little bit of extra flare in their toilet tanks. NOTE: Be sure to not add too many bricks. If you displace too much water, a single flush might not “do the job” and then require a second flush… thus negating the water savings that you were trying to achieve. Also, be sure to use fired clay brick as they are less likely to dissolve in water and affect your plumbing. It might even be a good idea to wrap the brick in heavy plastic just to be safe. These are just a few ideas on how you can save on your water bill with products available from RCP Block & Brick. Hopefully some of these suggestions can help keep your hard earned money in your wallet as opposed to being used to water your lawn, or flushing it down the toilet. For more information on any of the above products, or to speak with one of RCP Block & Brick’s knowledgeable sales staff, please contact an RCP location near you!